The original car is shown in the title block above. The car has been in the panel shop for about 3 years. 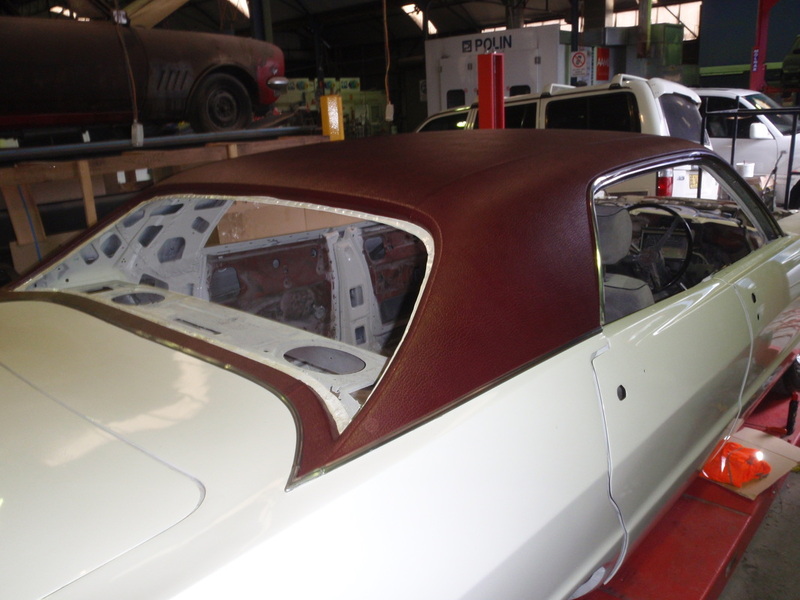 Rust has been removed, a new roof put on and the car is now slowly being put back together. The vinyl top was purchased ready made from SMS Auto Fabrics from the USA and put on in June 2012. Currently working on the doors. Rubbers are OK but needed new fishhook clips available from Pentastar Parts. New door handles are coming from Laysons Restorations in the USA. New Armrest bases and armrest pads can be purchased from PG Classic Restorations in USA. Door Belt outer weatherstrips (they go on the window sill on the outside of the window glass) can be sourced from Spectrum Rubber at St Marys. Posted October 2012.